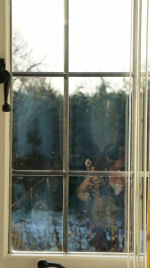 I describe on these pages a DIY repair for misted sealed double glazing units. The repair involved a fair bit of DIY work, but cost me a great deal less than either replacing all the window frames in my home or replacing only the sealed units. The existing glass, aluminium spacers and plastic parts of the failing sealed units were all reused, and the cost of the work was the price of glazing silicone sealant, moisture absorbing desiccant and some Stanley knife blades and windows cleaning materials. After the repair - misting gone and as clean as you make them....... glass, spacer bars and corner keys all re-used. I can't say for sure what the life of the DIY repair will be - but given the huge cost of replacement double glazing I think it is worth a shot. I've provided the information below on how I went about the repair for information only - not as a recommendation for others to follow - it might be of interest to other like-minded DIY'ers. After about 6 months all the repaired units have remained clear and without signs of problems - so far so good!. UPDATE DEC 2012 I've decided in the end to go back to using professionally made sealed units for the windows. The re-misting that I described in the April '12 update has continued even with the re-conditioned glazing desiccant. It might have been better with new glazing desiccant (if I could get it in small enough quantities) but it looks like the repair method described is likely to be one of limited life. UPDATE APRIL 2012 After about 12 months in situ some misting has returned to some of the refurbished units. This misting is different in character to the original problems however. It appears when the sun has warmed the frames and appears to be moisture released by the desiccant when it is warmed up.... Once the frames cool back down the misting disappears - the desiccant re-absorbs the moisture. After some further investigation it looks like this is due to the replacement desiccant I used. In particular it appears that the general purpose silica gel I used to replace the saturated glazing desiccant was not itself fully free of moisture. There is a remedy for this, but importantly the remedy can also be used to re-condition the glazing desiccant already in the sealed units. If only I knew this at the start - we live and learn! 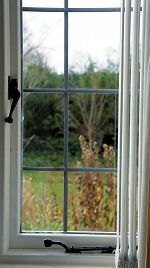 Twelve or thirteen years ago I replaced the troublesome single pane windows in my home with sealed double glazing units. Cash was tight at the time (new home and young family) and we couldn't afford to completely replace all the windows - so I measured-up and ordered sealed units and fitted them myself to the existing timber window frames which were themselves still in reasonable condition. It can't be expected that sealed double glazing units units will last as long in frames designed for single panes as they would in properly designed frames - however I've managed a creditable 12/13 years from the sealed units on the sunny side of the house; these have only now started to show signs of failure and are starting to mist up (image right).. Most of the other units I fitted are still going strong. The cost of fitting the individual sealed units was probably about 5-10% of the cost of getting a double glazing firm to replace all the windows completely - so I think it was a good choice at the time. The question however is what to do with the units that are starting to fail. The cost of completely replacing the windows is still very high (even if I could find designs that are similar to the existing timber frames) and this seems to me to be a very expensive solution to the problem - especially considering that the problem is primarily a sealing issue. There is not likely to be much or any significant damage to the glass and spacer bars used in the sealed units. I could just replace the sealed units with new ones - but this also seems a complete waste of good materials, and introduces the problem of disposal of the failed units. I decided to see if I could repair the failed units - if this was possible I could re-use all the existing sealed unit materials, do the work in my own time when convenient and save a considerable amount in the process. 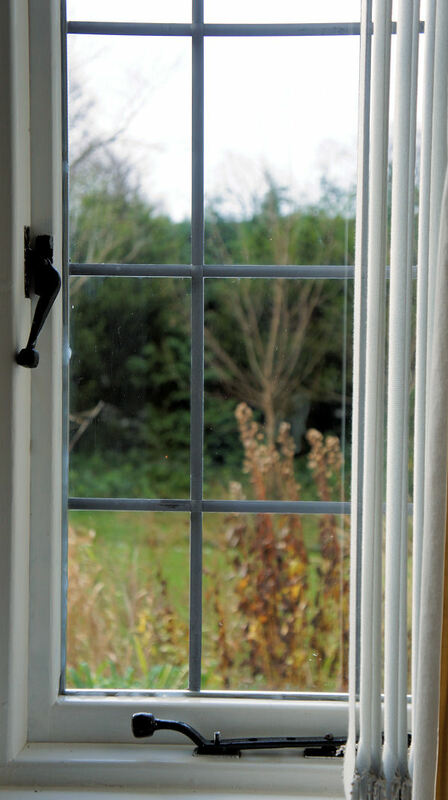 Standard sealed double glazing units such as those I have consist of two panes of glass with a hollow (typically aluminium) spacer frame sandwiched between them (the silver part in the image). The outer edge of the spacer is sealed during manufacture using a glazing sealant (the black material in the above image) to form an airtight barrier between the panes. The hollow spacer bar inner faces are perforated; the bars are filled with a moisture absorbing desiccant which is there to remove moisture from the air trapped between the panes. With the moisture thus removed by the desiccant there is no water vapour available to condense as liquid on the inner faces of the glass panes when the temperature drops - so the sealed unit remains clear in circumstances in which single panes would "steam-up". If the seal fails for any reason (and it doesn't take much of the seal to de-bond from the glass to cause a failure) external moisture-carrying air can enter the sealed unit. The desiccant in the spacer bars will continue to remove this moisture, up until the point at which the desiccant becomes saturated and can't absorb any more water - the humidity level in the gap then rises and liquid water can start to condense on the cold inner surface of the glass. The glass stains and because it is on the inner surfaces, frustratingly, can't be cleaned. My tentative plan was to try and split open a failed sealed unit, clean the glass, replace the desiccant and re-seal the whole unit...... a much lower cost solution than throwing out and replacing the windows. A number of important factors made it possible for me to attempt these repairs - and because window installations vary so much the approach I describe may not be suitable for all. 1. My windows were accessible - all my failed units were on the ground floor and accessible from ground level. If you have windows on upper floors it may be wise to leave their repair to professionals. 2. All the failed units were of a size and weight that made them comfortable to handle by myself. If you have larger heavier windows you may wish, again, to leave them to professional repairers. 3. I knew how to remove the sealed units from their frames without damaging either the units or the frames. If you can't do this then this type of repair isn't really an option for you. 4. I have good working space available, and was able to leave the repaired unit(s) out of the window frames for up to 6 hours to allow the new sealant to set. This type of repair activity is best attempted in warm weather with good day length (ie not in winter). 5. I am fairly good with my hands - if you are all thumbs don't attempt this. The approach involves working with sharp blades and dismantling the window components without damaging them, then putting them back together and re-fitting them in their frames. 6. I have backup arrangements to replace glass if I break any in the repair process, or to board up the window if, due to unforeseen circumstances, the repair takes longer than expected. If you want to try this type of thing give some thought to what you might do if you can't get the repaired sealed unit back into your window in time. If any of these conditions do not apply then you could easily get into difficulties attempting this type of repair. I provide the information on how I went about it only for reference for competent DIY'ers - not as a recommendation for all. Copyright � 2011-2012 BFF Design Ltd All Rights Reserved.